The day started with more layers than anyone could possibly wear when riding a bike. Everyone had heard the weather forecast the night before and expected a cold, blizzard-like beginning to the day. Surprise, a warm front had passed through and it was almost sixty-five degrees! An immediate shedding of the extra layers in the middle of the parking lot entertained many a hotel guest. The first business of the day was to cross the causeway over the intercoastal waterway. After several days of pure flat, a rise is a welcome sight, but being the first thing, it does tweak the leg muscles. Then it is on to just ride and ride and ride for over twenty miles. The left side of the road is the ocean lined with one beach house after another, the right also with beach houses, but for the most part one sand lot after another. With a little investigation we discovered that the hurricanes of 1995 wiped out most of the buildings of the area, and the communities are still in a process of rebuilding. The skies had opened by now so the rain was gently falling. The air temperature being as warm as it was made the ride seem effortless. 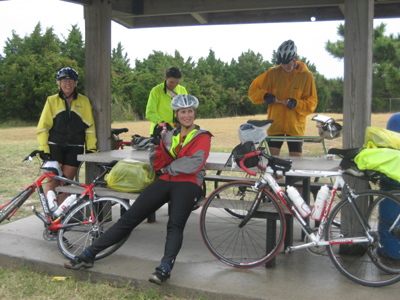 The rain didn't hinder, nor chill the body, so one just tucked and pedaled over the roadways following the coast from one barrier island to another. Wilmington was picked for lunch -- for no other reason other than it was raining, it is a large city and it was the first town that showed any sign of having food. A turkey dinner with extra gravy and everyone was happy again. Unfortunately a very nasty railroad track just before the stop brought a couple of the riders to the ground. Fortunately, other than a scrape and bruise here and there, there was no serious damage to anyone. It did slow the "train" down and remind all of us that a wet road is also a greasy one. 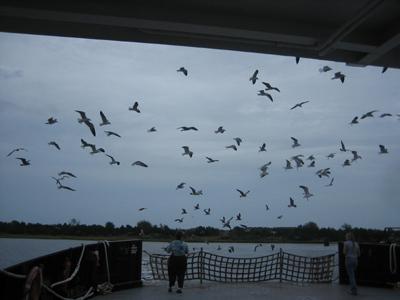 Wilmington today is a large port town, but it has a rich history. Whistler's mother lived here in a house just off Main Street; the street is lined with plaques of generals from the Revolutionary and the Civil War who lived in the area as well as famous NC governors that were born near by. Leaving the restaurant it was back on the trail again, however this time it lead to a dead end! Seems our maps are a couple years old and in the meantime the city of 'Wilmington has built an expressway right in our way! Some of the locals advised to just turn around and "jump" on the expressway into the city -- not a great welcoming idea to a bunch of bikers -- one local said "get bumped ahead, the route is too dangerous"; another said "I won't go there!" It takes more than that to stop us -- after analyzing all the options, it was decided to forge ahead and climb over a fence onto the freeway -- figure a way to not get hit-- and exit on the "Downtown" exit. Not too bad! After carrying bikes over a field of who knows what, we found a gate through the fence, clambered through and ran toward the lane that we needed to be in before some policeman spotted us. Bikes on a freeway are not popular!! End result = success. We made it into downtown without any problem. Now well on our way we flew through the town and out into the countryside once again. The rain was still with us, so when a truck or RV passed it did create a problem for those of us wearing glasses. It is one thing to be rained on on the front of your lenses, but when a big vehicle splashes, it is the inside that gets it full force. Makes for a very cloudy vision!! Once on River Road we followed the coast line down pass oil refineries, military bases, and ports. As we settled into the coast ride we found ourselves going from one vacation beach home to another. 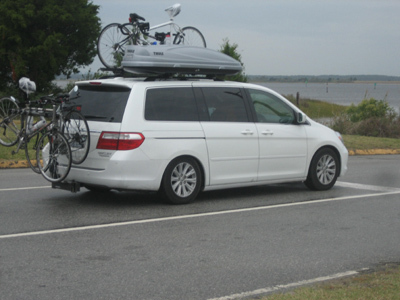 Kure, Carolina Beach State Park, Fort Fisher and then finally to the ferry to Southport. 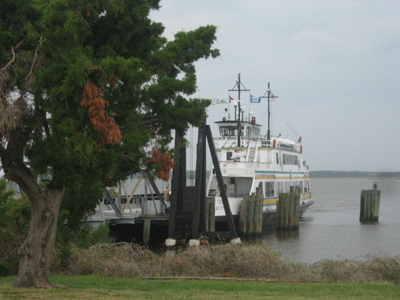 Tucked quietly on the end of a strip of sand dunes and inlets is the ferry port. Its ride takes you pass oil depots and swamps. All in all it is a beautiful, peaceful ride. Upon exiting the ferry, the town of Southport was just down the road. A quaint old town nestled close to the waterfront, showed signs of a glorious past. The homes are small on its main street, but each with a neat character revealing a past of long ago. The Birds Waiting to be Fed!